Webster’s has a very attractive street appeal. Inside the décor is warm, friendly and inviting. There is a well-founded confidence here. Customers feel it as soon as they arrive, and the staff shows it too knowing that what they have to deliver is top quality food prepared with care. There’s a small drinks list but everything is of good quality and mostly local, and the coffee is very good. Webster’s cares about its customers and the quality and provenance of the foods. The menu was terrific and the tableware interesting, with dishes served on a variety of plates. Each dish had excellent presentation. Stand outs included the share plates, the lamb and lentils, and the desserts including wonderful sticky date pudding and a gluten free orange and almond cake. Both had a gentle spiciness to them. You could happily spend hours at Websters enjoying the share plates and a glass or two off wine, or a coffee and cake, or a three-course lunch. Anyway you look at it, this place delivers what customers want and while Websters is not cheap but the value for money is excellent. Warm, friendly and inviting decor. Great Customer Service. Focus on wholesome and tasty local foods. Small but good wines, beers and ciders list. Great Coffee. Good value for money. 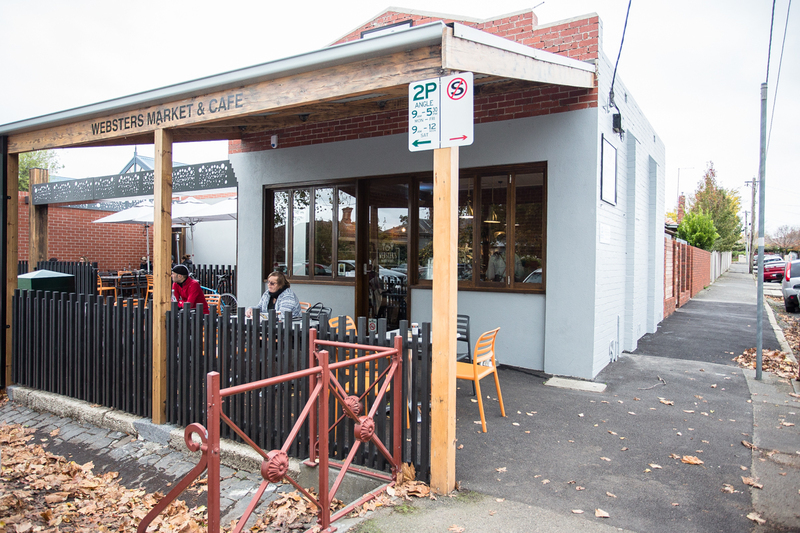 Websters Cafe and Market is small but comfortable and the display of cakes adds to the atmosphere – like a decorative feature. And what a great way to start the day! So many of the array of breakfasts small and large, with and without gluten and available all day would set you up for the day. It’s a lovely place to take a pause in the day, sitting over a coffee or pot of tea, watching the leaves rustle in the trees in the street, or for lunch perhaps a bowl of soup or a baguette. The food is imaginative, thoughtful, and well prepared; the atmosphere bustling and welcoming, and the coffee is very special. We were impressed by the list of suppliers of regional and Victorian produce. And the children’s menu is a sensible one that’s reasonably priced. The fruit with yoghurt, and the house-cured salmon were very good, and we loved the strawberries -full of flavour. Even when full staff were friendly, welcoming and make eye contact. It’s a busy and informal café but the attention to customer was good. Water is provided quickly, the menu brought quickly, and a well laid out menu that is contemporary in its style. Websters served an excellent range of coffees and styles, including filter and cold drip. The cups are beautiful – generous size, good to hold, nice to drink from. Presentation was very good and the coffee rich and full-flavoured. A great pleasure to drink. Websters delivers excellent value – not a cheap café but one that offers thoughtfully designed and imaginative food well presented. The option to sit and relax outdoors is a real plus too. Multi-award winning pub renowned for its extensive selection of beers, ciders and wines. Not your average country hotel. Cortillé showcases love & support for local produce, musical talent and local artists and Axil coffee.